Is love really lovelier the second time around? Playwright Kathleen Clark offers a definitive yes in “Southern Comforts,” currently on stage at Heartland Theatre. Clark’s play involves Amanda, the Southerner in the title, and Gus, a more taciturn Yankee in New Jersey. They’ve both loved and lost in the past, and neither is looking for any kind of romantic entanglement at this late stage in their lives. But when Amanda stumbles into Gus’s sparsely decorated home trying to drop off some church envelopes, they discover they have more in common than they might’ve guessed. On the outside, it’s a classic match-up of opposites beyond just the Southern/Northern thing. She’s chatty and perky while he’s laconic and reserved. She dreams of traveling to other countries, while he prefers to stay within sight of his garden. She likes to fill her life with lace curtains and soft pillows, while he wants his house and his life to stay virtually empty. She loves books and used to be a librarian, while he’s a retired stonemason who’s very good at putting up walls. Initially, all they have in common is baseball. Soon, however, they discover that they share a yearning for companionship and warmth, for a love that could be eminently more satisfying than their first marriages. 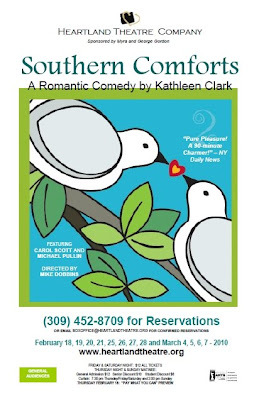 “Southern Comforts” is a sweet, gentle play – there are no huge bombs or explosions, literal or metaphorical, in this script – about the difficulties and transformative power of love, no matter the age of the lovers. It’s about being set in your ways, and yet flexible enough to accommodate change, a scary proposition even if you go in with your eyes wide open. That’s illustrated on stage when Amanda and Gus discuss her moving in with him. He knows she’ll be bringing a lot of baggage – books, pictures, knickknacks – but the reality is something else altogether. And in the end, it’s his baggage that’s the problem. I can pretty much guarantee that “Southern Comforts” is the only play you’ll ever see where choosing a headstone is both an obstacle and a sweeping romantic gesture. Heartland director Mike Dobbins chooses to set the play in 1986, which makes Amanda and Gus somewhere in their early 60s by my calculation. That works well for his actors, Carol Scott and Michael Pullin, who certainly wouldn’t be realistic as 80-somethings if it were given a contemporary setting. Dobbins emphasizes the humor in the script, keeping the tone playful and light, and that also keeps the story skimming along without too many sticky moments. He notes in his opening remarks that “Southern Comforts” is a perfect play for this Valentine’s season, and I think he’s got that exactly right. His actors are also on target. Scott and Pullin play well together; she shows a nice touch of mischief under Amanda’s Southern charm, while he gives Gus a heart under the American Gothic, no-nonsense exterior. Pullin also designed the set, and it looks good both in its initial spare phase as well as the girlied up version later on. “Southern Comforts” runs through March 7th at Heartland Theatre. For reservations or more information, you can click on that link over there on the left. I look forward to seeing this one. You have created a great resource for area "theatre types" to discuss all sorts of work. Yipee!! Thanks, Holly. Please tell all your friends -- the more discussion, the better!